You look around your yard and don’t like what you see. Old pieces of plywood you planned on using leaning against the house. An old riding lawnmower sits under the tree. Tree branches, old bags of leaves, and the basketball goal with the broken backboard. The list goes on and on. That’s where Mr. Junk comes to the rescue. 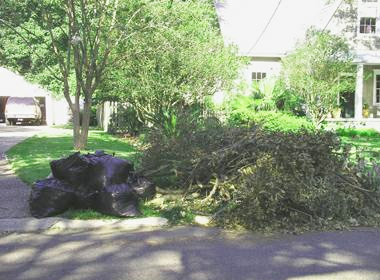 We will quickly and easily remove all yard debris and beautify your home’s exterior. You will feel better every time you pull in the driveway. Call Mr. Junk at 678-Mr-Junk1 or schedule a pickup online. We can be there same day and at a time that’s convenient for you. How easy was that? Whatever the season, a strong storm can wreak havoc on your home and property. Be prepared by cutting back branches and trees and bring inside any objects around your property that can become projectiles in a violent storm. Having your property free of debris is a great way to prevent accidents. No matter how prepared you are, sometimes the worst happens. When it does, we are ready to haul away any debris like broken branches, siding, roof shingles, flooded carpeting or the construction debris from your restoration project. Having Mr. Junk pick up your leaves and yard debris is a no-brainer. Organic material can be easily turned into mulch or fertilizer rather than taking up space slowly rotting in a landfill. If that doesn’t make you feel good, think of all the time you will save not having to bundle and bag everything. If you are planning a home or office renovation and are thinking about renting a dumpster, you may want to consider Mr. Junk. We will load your construction debris, sweep the area clean and haul it away without you ever lifting a finger or breaking a sweat. With Mr. Junk, you pay for exactly what you have, not the dumpster like other junk removers.